Frequently Asked Questions : Magic Brush Pets Unleashed! Q. I'm confused - How do I get exactly what I want? A. Excellent question. I'm glad you asked! 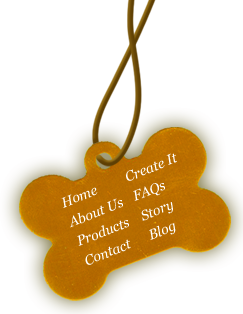 We've tried to make this site very user-friendly, but it's very special and new to have a site where we offer you standard items that you can just click and purchase, semi-custom items where you can add your pet's name, or fully custom where you can work with us to start from the ground up and create ANYTHING you want! If you can't quite find your way through this website, please just go to the 'Contact Us' page and send me an email saying HELP!! I will contact you and we can sort it all out together! Q. This Website is FANTASTIC!! Who created it and how can I get one of my very own? A. You're right, it's amazing and I love it! This site is the result of a year-long journey of creativity and love and patience and just plain making stuff up to make it work out by Anne Adele of Dwarfdog Design, Jennifer Deiley of Jen Deiley Designs and Allison Price of Word Tree Communications. Aside from being amazing web creators, they are also artists and pet lovers to a degree that inspires me. As much as I love this website, I love them more. And as awesome as this site may be, there is always tweaking and improving going on, so if you have any comments or suggestions, please let us know! In the words of my friend Jennifer Davis, "I'm a work in progress". Q. Can I order the red picture frame, but in blue? A. YES! You can custom order anything in any colors you want! Just click on CREATE IT on the dangling dog tag, or go to the You Dream It page for photos and ideas from other lucky clients, and dream away! A. Everything! I like to say that I am like a bee making honey. I fill up my heart with everything around me that inspires me - art, sunshine, music, flowers, water, wet dogs, bugs, fresh cut grass, snowflakes, people I love, chocolate, kitties zooming through the garden, laughter, new shoes . . . and I fill up my soul with all that and it all comes out in my art. Just like a bee making honey, Honey. It's delicious! Q. Who does this delightful artwork and what kind of products do you use? A. I wish I could tell you that pixies fly in every morning with espresso and chocolate croissants and we paint all day with magic and pixie dust, but the real truth is that I am the lucky girl who gets to design, carve and paint everything myself. Fortunately when I get super busy, I have some wonderful artist friends who come over to my studio and we play with Butter and listen to music and talk about boys and paint! We use only safe, water based, artist quality products on natural wood - mostly pine, alder and poplar . . . (with some magic and a little pixie dust). Q. Can I order any product with my pet's name on it? A. YES! We will happily paint your pet's name on any of our items. There is no additional charge for this customization, except for the greeting cards, which have a small printing service charge to include your (or your pet's) message inside, but it's worth it! Q. Is my pet the greatest pet ever? Q. How do I know what size Little Box of Heaven to order? A. Our standard Little Box of Heaven is 5"x7"x4 1/2" and is the perfect size to hold the little cardboard box of ashes of our beloved kitty Wendy, which we received from our vet. The box is sealed with a certificate with her name, and we just set that right in the Little Box of Heaven, along with her favorite little jingle ball, collar, tag and some photos, and a little love letter from us. If this size works for you, then you can simply order the standard size. Of course every pet is unique and special, and this standard size, shape or or design may not be exactly right for you. No problem! That's why we have the Customize It option for all of our items. We are happy to create your Little Box of Heaven just the way you want it.